After teaching children for over 20 years, we have a great deal of experience creating a variety of learning materials. Jenn runs guesthollow.com, a website recieving an average of 90,000 pageviews a month with over 7,000 files of free printables, curriculum, articles, reviews and more. 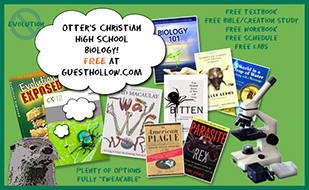 Her learning materials are widely used in the homeschool community and she was hired by a curriculum publisher to create a learning guide complete with a packet of printables. She has been very blessed with the opportunity to create engaging materials and curriculum for a student with minor learning disabilities as well as working with the other end of the spectrum with gifted students. Much of her curriculum was created to engage reluctant learners while at the same time allowing for gifted students to pursue subjects in more depth. Jenn also does not limit herself to just teaching children! She recently created (and taught) a lesson for nursing students on how to do I.V. math. Jenn is available to create a variety of educational materials for both print and digital format. Create custom curriculum with a schedule, list of books, extra resources, etc. We will also consider advertising your education related product via an ad button or banner (which links to your website or product page) on the Guesthollow.com website. 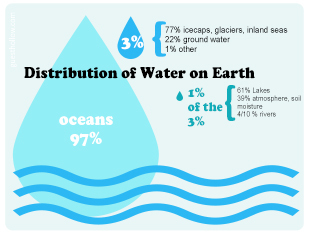 Below is a small sampling of our work and additional information. In addition to the tools listed above, we also have the teaching experience and creativity to get concepts across! Metric teaching resource This math instruction sheet was created to help students understand how to convert metric numbers. Jenn understands that students learn in a variety of ways and made sure to address that by showing more than one way to accomplish the same thing. She also created friendly characters and the easy to understand "stair steps" to illustrate the text concepts for visual learners. 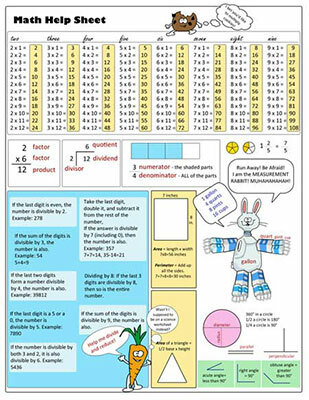 Math help sheet This math help sheet was created for a notebook to remind students of basic elementary and early middle school math concepts. Humor and color are incorporated to appeal to students. 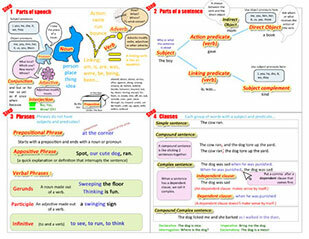 Jenn has created many cut & paste activities to reinforce learning. 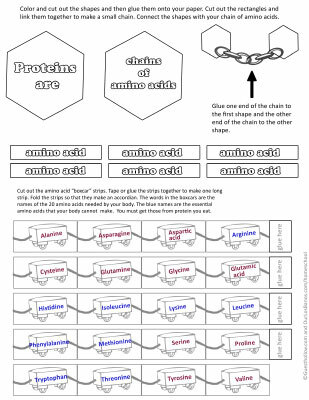 This activity was created to help students retain the fact that proteins are chains of amino acids. Click on the link to see both pages. We can create custom handwriting sheets that contain just text or text and graphics. We have purchased a license to access to most of the major school handwriting fonts such as D'Nealian, Zaner-Bloser, Getty-Dubay Italic, Handwriting without Tears and more for the purposes of making printables. 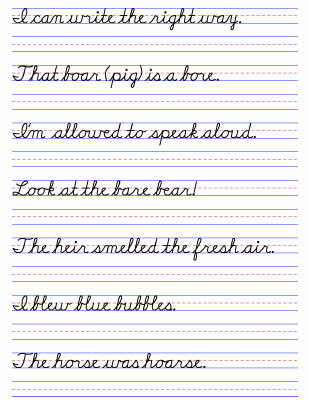 Grammar help sheet This printable was created as a reference sheet to help a student mark sentences in a grammar practice book. 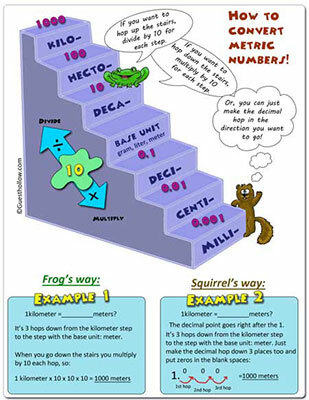 Each step is clearly illustrated with many visual helps and examples to clarify concepts. 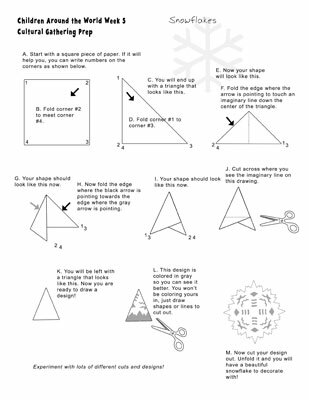 This printable teaches a student how to make paper snowflakes. 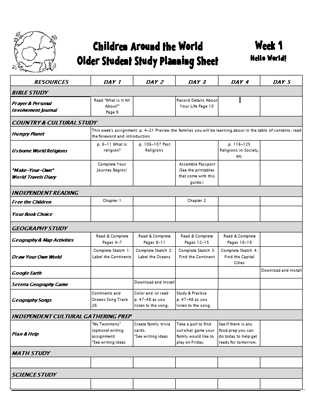 This page is from a packet of notebooking pages to help students study different countries. 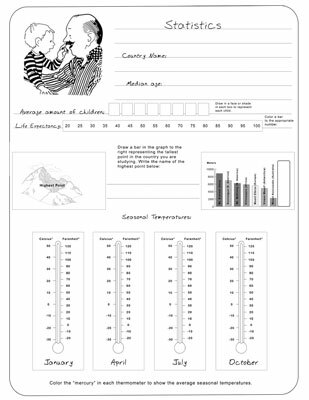 In this sheet students fill out a country's name and other information such as average amount of children, life expectancy, seasonal temperatures, etc. in a visually engaging way. 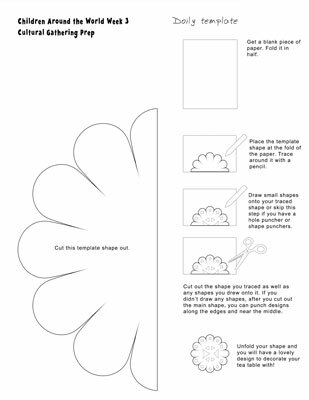 This page teaches students how to make a homemade doily as mentioned in an accompanying text. This is an example of the daily/weekly schedule that was created. Jenn was required to research resources such as books, videos, online activities, and other items to add to the study. She also created writing assignment prompts that went with the weekly themes. 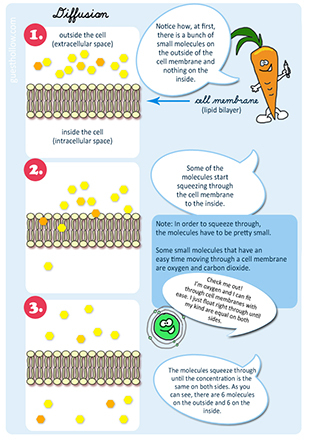 The following graphics are a small sample of illustrations created for a biology textbook. Jenn has created curriculum for her own children for years. She has also recently created curriculum for hire. "None of the curriculum plans I've ever bought have worked for my son. None were written in such a simple, easy to use manner. Some were too heavy on the writing. Some were too light on the reading. None had the attention to detail that Jennifer's included. Each activity has a purpose; each book carefully researched to find the appropriate yet fun and engaging projects. We love it, and look forward to more plans made by Jenn!" "I just wanted to thank you for putting this curriculum up for everyone to enjoy. After having used it, I realize how much time and thought was put into the planning. I used this with my second grade son and he absolutely loved it. He has learned so much...and retained the information. I'm amazed. He has a love for science after this year. It's going to be hard to compete next year." If you would like to hire Jenn for your next project, please contact us. Jobs are taken on a case-by-case basis where Jenn makes sure her skills and your needs will be a great fit.